The Milwaukee Public Museum curatorial staff have selected 133 of the most important, unique, or interesting objects and collections to highlight during our 133rd anniversary year. These items reflect the broad scope of the over 4 million-plus objects in the Museum's collections. Many of the items featured below are not on exhibit due to their fragile nature. One of the Museum's primary goals is to preserve objects for generations to come. As a virtual exhibit, we can share with people around the world our most rare and intriguing items without harm to them. The Chilkat is a Tlingit band that lives in southeastern Alaska. Their blankets, woven from mountain goat wool and cedar bark, are five-sided, heavily fringed, and display stylized animal figure designs. During important ceremonies the blankets are worn as capes. The Chilkat blanket weaving tradition originated with the Tsimshian people who live south of the Chilkat, but the tradition spread to them through trade and marriage. 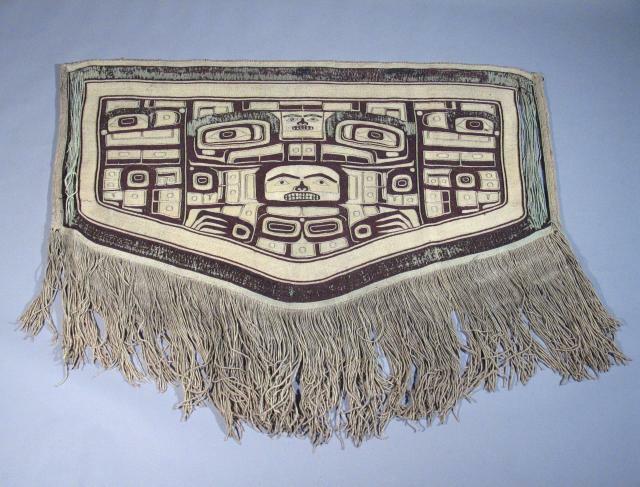 The Chilkat refined this blanket weaving style to its highest level in the late 19th century but largely died out about 100 years ago; the traditional form is continued by only a few weavers. 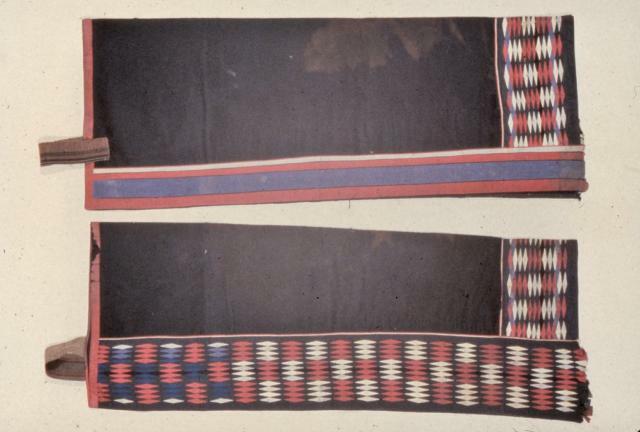 Dr. H.M. Brown of Milwaukee received this blanket as payment by an American Indian father for treating his daughter. It was donated to the museum in 1929 by Dr. Brown's wife. Robert Zingg and Wendell Bennett were graduate students at the University of Chicago when they led an anthropological expedition to study the Tarahumara in Chihuahua, Mexico for nine months in 1930-1931. The expedition was one of the first modern studies of remote Mexican Indians, and the work published from their studies is one of the few on a culture of Northern Mexico. The collection consists of approximately 400 items ranging from basic clothing and housewares to objects used for dances and ceremonies. It is one of the earliest, most comprehensive, and largest Tarahumara collections in the United States. Some of these items can be seen in the Mexican area on the 3rd floor. The Navajo rug collection is the largest museum-held collection of its type in the state of Wisconsin, comprising over 200 rugs representing all major types, ages, and styles. As early as the 1800s, the Navajo were recognized for their high quality of weaving by both neighboring American Indian groups and the Spanish. The changing designs of the rugs have been influenced by trade and later, tourism. 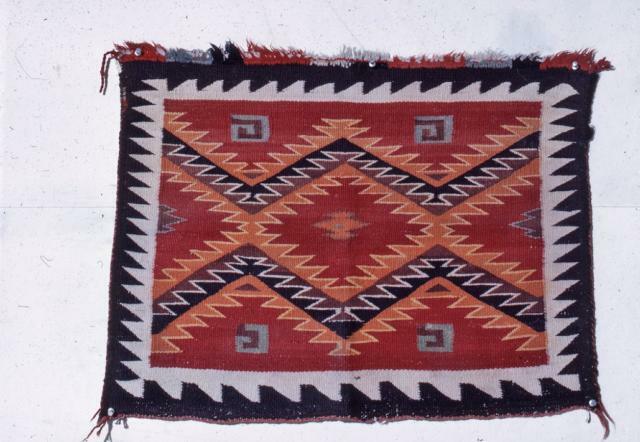 Several examples of these rugs can be seen in the Southwest exhibit on the 2nd floor. Milford Chandler was an automotive engineer and collector of American Indian material. He did most of his collecting between 1915 and 1926 while living in Chicago. The Miami material was collected by him in Peru, Indiana. The material includes a woman's robe, a pair of woman's leggings, a pair of men's leggings, and a hair ornament. The majority of the Miami were relocated in the 1800s to Oklahoma. Those who stayed in Indiana became largely acculturated into American society; as a result, material culture from the Indiana Miami is quite rare. 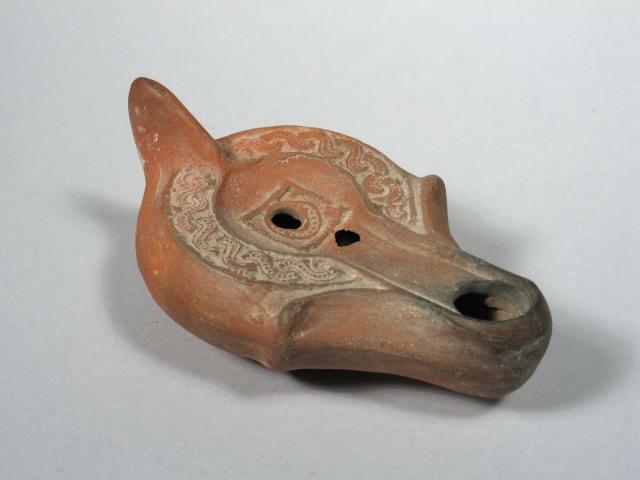 Oil lamps were used throughout the Roman Empire and consequently are common artifacts from the ancient Mediterranean. The Milwaukee Public Museum's collection consists of over 200 lamps with examples from various time periods and regions, making it a very good study collection. The lamps were collected from a variety of sources over a span of about 100 years. Some of the lamps from this collection can be seen in the North African area on the 3rd floor. R. N. Hawley, a native Milwaukeean, was a surgeon on the U.S. Revenue Cutter Bear in the late 1800s through the early 1900s. 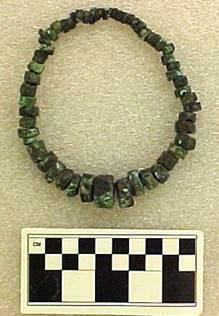 While on several voyages to northern Alaska and Siberia, Hawley collected material from various Inuit (Eskimo) groups. 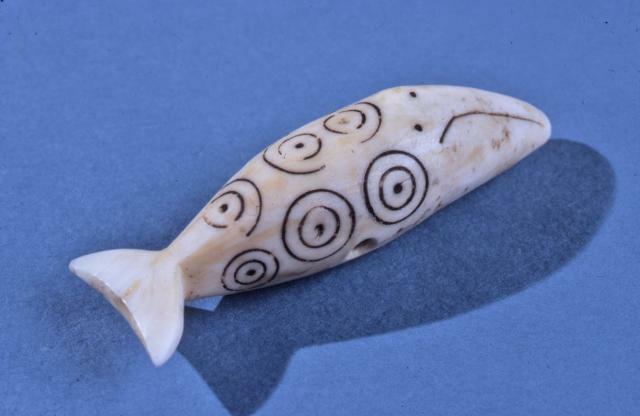 The collection, acquired by the Museum in 1900, consists of 255 objects that include fishing equipment, models of kayaks, carved walrus tusks, and housewares made from bone and wood. The early date of Hawley's collection illustrates the more traditional forms of these types of native items, prior to the groups modifying items for tourism. Objects from this collection are currently on display in the 3rd Floor Arctic exhibit. The Old Copper Complex (Culture) Collection contains native copper items made in the Great Lakes region from 3000 - 1000 B.C. The source for the copper was a Wisconsin quarry on Lake Superior; the raw copper and finished items were traded throughout the Midwest. The earliest copper items were utilitarian in nature, such as fish hooks and projectile points. Around 1500 BC more items of personal adornment were appearing, a change thought by archaeologists to signify increased social stratification. This rare thunderbird suit was acquired by Milwaukee Public Museum Curator of Anthropology, Samuel A. Barrett during a 1914 - 1915 expedition to the Kwakwaka'wakw (Kwakiutl) territory on northern Vancouver Island and the adjacent mainland of British Columbia, Canada. 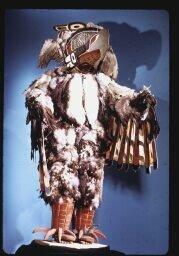 The mask and leggings are mostly wood, while the headdress and suit are primarily eagle feathers. The thunderbird is an important figure in the Kwakwaka'wakw culture and is considered an ancestor in some tribes. The suit is displayed on the 2nd Floor in the Northwest Coast exhibit. This collection came to the Museum through a 1911 summer expedition to the Hopi reservation in Arizona led by MPM Curator of Anthropology, Samuel A. Barrett. The collection consists of about 3300 items. The collection documents a wide variety of items from baskets and clothing to spiritual items, as well as pigments and tools used in their production. Highlights from this collection include ceramics, such as the one depicted here, from Nampeyo, or "snake that does not bite", who is credited with revitalizing Southwest pottery during the turn of the twentieth century. 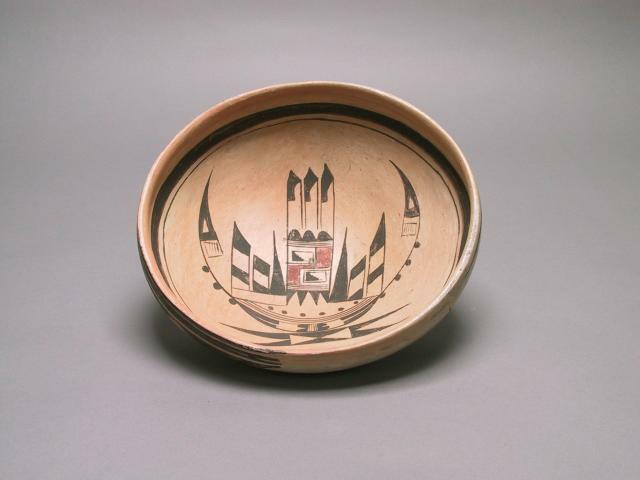 Utilizing pot designs from prehistoric Sikyatki earthenware, Nampeyo incorporated her extraordinary abilities as an artist with ancient methods and images. Barrett traveled to the Tewa village of Hano on the First Mesa in Northern Arizona to photograph and collect some of Nampeyo's work. Due to Barrett's meticulous collecting and recording, the Milwaukee Public Museum houses an extensive assortment of Nampeyo's work including the materials and tools she used to create her pots. Several items from the collection are part of the 2nd Floor Southwest exhibit. The Waiwai are a native Amerindian group living in southern Guyana (formerly British Guiana) and northern Brazil. There are approximately 200 Waiwai living in Guyana and 2000 in Brazil. Of the native groups in Guyana, the Waiwai have remained the most traditional, but have still been influenced by missionaries to the region. 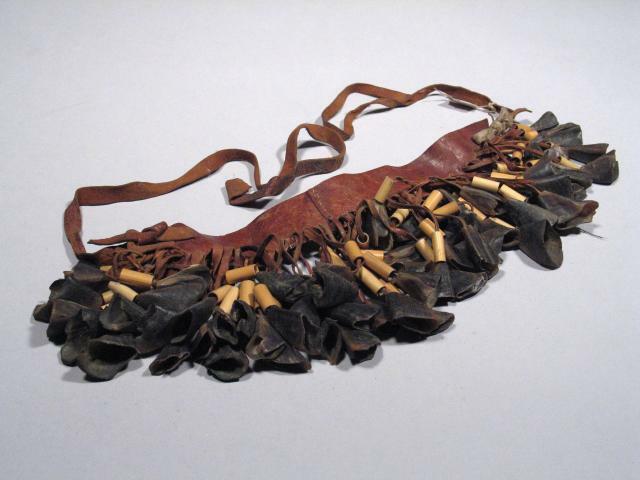 The 33 items in this collection mainly represent everyday items such as basketry, bow/arrows, and body ornamentation. 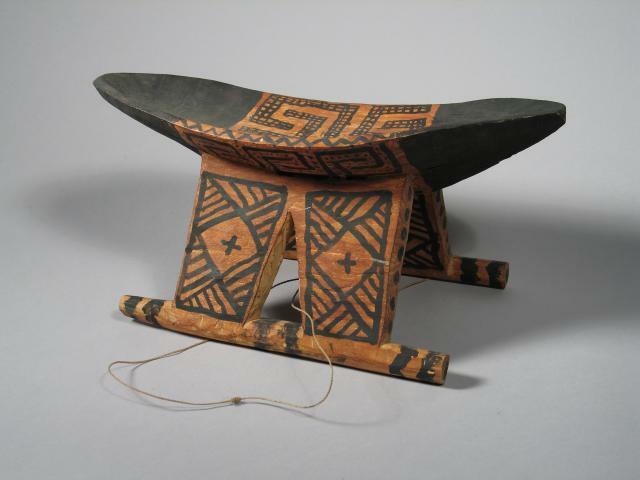 The collection was acquired in 1965 on an expedition led by Lon W. Mericle, a Museum Research Associate in Anthropology. Few museums in the United States have material produced by this tribe.